We arrange private, fully escorted tours of the Russian Golden Ring for individuals and small groups. We offer some standard Golden Ring tours but we can easlily customize a tour to include any special interests or needs of the group. The Russian Golden Ring, winds in and out of cities and villages in the North-Eastern part of what used to be the State of Muscovy. It is hardly circular but it certainly is "golden" in the sense that it is rich in historical relics and towns that are museums in themselves. The Golden Ring is popular with both Russian and foreign lovers of old Russian architecture. In the late 60's Soviet experts began the serious work of restoring these masterpieces. With the reemergence of the the Church since the fall of the Soviet Empire, the work of restoration is going on all over Russia. The Russian Golden Ring now is now available to visitors as a magical window into Russia's colorful history. On our Golden Ring tours you will come close to the life of today's Central Russia as well as have the opportunity to come close to a thousand years of Russian history. Many of these towns are visited on our tour Moscow and the Golden Ring of Russia. 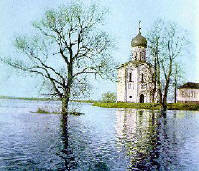 You may also book the Golden Ring part of this tour as a standalone 5 day exploration of the Russian Golden Ring. Here we offer a brief background of the key towns of the Russian Golden Ring. 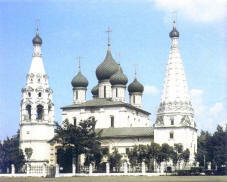 Several of these towns are included in Moscow Day Trips and may be substituted in, or added to, a Russian tours package. Moscow and the Russian Golden Ring. This tour includes 4 days of Moscow tours and 5 days travel in the Golden Ring of Russia. . more..
Travel in the Russian Golden Ring. Begins and ends in Moscow. more..
A tour of the Russian Golden Ring focusing on traditional Russian handcrafts. 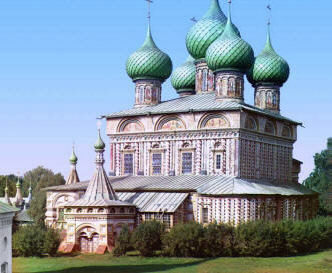 A Russian tour for school groups more..
An Overnight trip to the old Russian captial of Vladimir - Suzdal more.. Spend seven days and six nights traveling in the Golden Ring of Russia. more..
Click on the highlighted towns for more pictures and information.